A terrifying World War Two setting, fully compatible with the Call of Cthulhu, Sixth Edition roleplaying games. Discover the secret history of events that may (or may not) have even occurred in our world or on an alternative earth: strange times or portals that cross worlds, doppelgangers with shared memories, walking tanks and VK enhanced weapons; super intelligent gorilla astronauts, and a world war that could become a dimensional war destroying all life as we know it. A crossing over of the mythos engaged Achtung! Cthulhu world with the enhanced technology and altered history of the mythos free Dust universe. 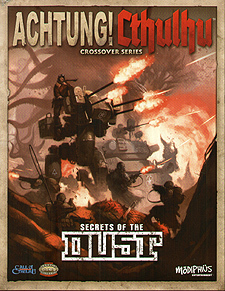 New rules on how to include VK enhance armour weapons and walkers for the Dust universe in your Achtung! Cthulhu games. Two adventures, one set in the Dreamlands and the other in an alternative timeline of our earth that can be played by characters from either World War Two or the Dust universe. In fact, a whole crossover dossier's worth of useful alternative historical and fantastical information to help you expand your campaign into the wider dimensions of the secret war.